Last week, I asked my email newsletter readers to submit “one data analysis problem you are struggling with”. We called it BYOD – Bring your own data. More than 100 people have emailed various interesting (and often very difficult) problems. This week (between 16th of February to 20th of February), let’s take a look at some of these problems and solve them. This problem is sent by Robot Mak. Imagine you are a category manager at a large e-commerce company. Your site offers various products, but you don’t really make these products. You list products made by other vendors on your site. Every day, these vendors would send you invoices for the amount of product they have sold. Here is a snapshot of such invoices. But first, what is consistency? Consistency is the kind of word that means different things to different people. So when we analyze a set of data to find most consistent item, the first thing we need is a consistent definition of consistency. Let’s look it up in the dictionary. The keyword is uniformity. So in our case, we can say a seller is consistent, if they are sending invoices fairly regularly. We have 11 days of data in the data-set. So who would be most consistent? Let’s say 2 sellers have sent invoices on each of those 11 days. Then who is most consistent? Both of them have consistency = 100%. May be we can calculate weighted consistency %? Since for this e-commerce business, the most important factor is revenues (well, it should be profits, but we don’t have that data here), we can calculate weighted consistency by adding a fraction that depends on the value of total invoice amount. 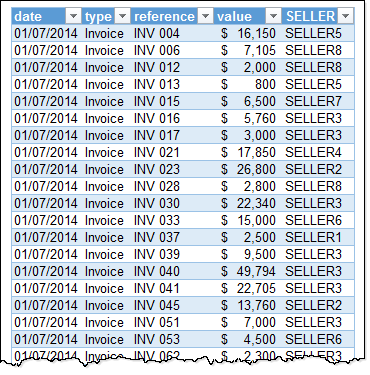 Insert a pivot table from the invoice data. While the pivot table approach works, it is ad-hoc. That means, we can’t extract the names of sellers automatically. We can use Excel formulas to answer all these questions elegantly. Now we just need a few doses of INDEX+MATCH formulas to answer the questions. Who is the seller with fewest invoices? Click here to download example workbook with all these calculations. Examine the formulas & pivot table to learn more. How do you measure consistency? What about you? Do you measure consistency of your data? What techniques do you use? Please share your techniques & tips in the comments section. Great Chandoo. Keep it up, Looking forward more from BYOD..
With Excel 2013 the pivot table could be connected to the data model which provides a distinct count. Excellent document. How did you make the last graphic? Witch app. Thanks for answer. 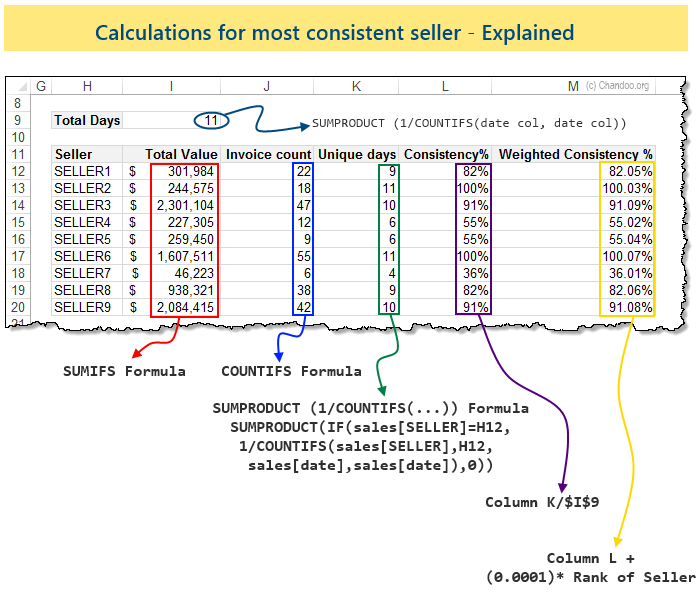 =countif(sales [date],sales[date]) function is counting the unique dates in the table. Can you explain more about the calculation on Weighted consistency? More specific the small number is 0,00001 ? How come the number should be smaller if there is more sellers?